Following allegations he didn’t move fast enough to rid a racial slur from land his family leased for hunting, Gov. Rick Perry’s critics are dissecting his history with race — from his early campaign ads to his defense of Confederate symbols. Many of Perry's fiercest opponents have jumped to his defense, saying he's got a long history of appointing minorities to key state government posts and isn't a racist. The question of Perry and racial sensitivity is not likely to go away soon, if only because the state Department of Motor Vehicles board faces an upcoming vote on whether to allow motorists to buy a specialty license plate prominently featuring a Confederate flag. The Sons of Confederate Veterans is proposing the plate, which would raise money for it to place markers on the graves of Confederate soldiers and create monuments to Confederate heroes. A similar request by the SCV was denied two years ago, when a different state agency handled license plates. But in April, the DMV board split 4-4 with one member not voting. After that board member died, Perry replaced him with Raymond Palacios Jr. of El Paso. He has declined to say how he will vote. A spokeswoman for the governor told the Associated Press this week that the issue was up to the board but Perry is likely to be asked whether he supports the SCV's request. 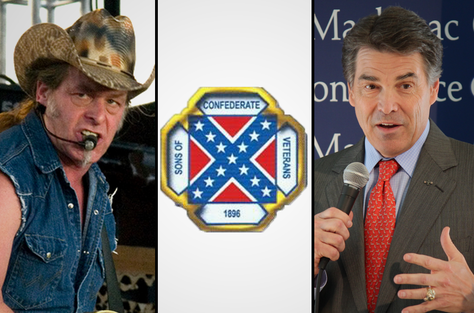 Here’s a multimedia look at four past issues that have drawn critics' ire: Perry's defense of far-right rocker Ted Nugent, who wore a shirt emblazoned with the Confederate flag to perform at Perry's 2007 inauguration, a newsletter from the Texas chapter of the Sons of Confederate Veterans on Perry’s attendance at a 2003 fundraiser, a 1999 Senate resolution passed when Perry led the upper chamber naming April Confederate History and Heritage Month, and a political attack ad from Perry’s 1990 campaign for state agriculture commissioner that featured an image of civil rights leader Jesse Jackson with Perry's Democratic opponent, Jim Hightower. Click on each of the four tabs to view the issue. After Ted Nugent performed at Perry’s 2007 inauguration ball wearing a shirt emblazoned with the Confederate flag, reporter Jay Root called Nugent to ask about the uproar. Nugent, who calls it the “Rebel Flag,” said the “good governor” called him afterward to express his continued support. During Perry’s first statewide race — for agriculture commissioner, in 1990 — he was accused of “race-baiting” by connecting his Democratic opponent, Jim Hightower, to African-American civil rights leader Jesse Jackson, in a series of TV ads. (Hightower had supported Jackson’s 1988 presidential bid.) Jackson appears in two spots, including this one, which features a black-and-white video of him raising his fist with Hightower. “Do Agriculture Commissioner Jim Hightower’s scandals bother you?” a narrator asks.